Every week I’ll bring you a new puzzle, drawn from some of the best and worst adventure or puzzle games I’ve ever played. Every once in a while I’ll even leave you one of my own for you to solve. If you do, I’ll find a way to reward you! Still, no one has solved the last puzzle I created. I’m not going to put up a new one until you do. It’s an important one, so please take a crack at it! Just need to replace symbols with letters! For convenience, every word is separated by ++. This week’s puzzle is from one of my favourite Point & Click adventure game series, Monkey Island, a game that’s already been on this feature a few times. 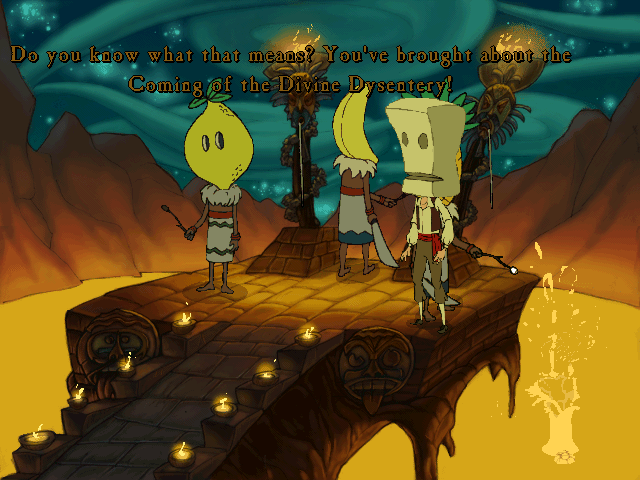 This puzzle comes from The Curse of Monkey Island, the third game in the series. On Blood island you need to find a way to remove the cursed ring from the petrified fingers of your beloved Elaine Marley, but the damn thing won’t come off! Fortunately, your trusty crew member Haggis McMutton has some lotion if you can bring him something sticky like tar for the work he’s doing. That should be easy, no? Even if you don’t have the tar, you can surely melt something using the local hotel’s barbecue! Except the barbecue is cold and you don’t have any way of heating it. There is a volcano though, and a local tribe of friendly vegetarian Cannibals…hmmm. Legends say the Volcano god is intolerant, but to what? What I love about this puzzle is that it’s really moon logic. There is no logical leap for you to even suspect that you need to melt something to give to Haggis or that the solution is with a Volcano. There just isn’t. But with the game’s tone and outlandish puzzles reaching this stage, you can figure it out based on “it’s so crazy it just might work!” It’s yet another example of how LucasArts mitigated the frustration of its crazy puzzle design with a good dollop of humour. Be sure to come back next time for some more interesting puzzles! And if you manage to get a copy of Monkey Island 3, might you consider sharing it with me? It’s been years since I’ve played it and I want to give it another go!